Last October, nine-year-old Oisín Millea found a green two-liter soda bottle on the beach near his home in East Passage, in County Waterford, Ireland. Inside was a note from two 12-year-old girls from Quebec, who had tossed the bottle into the St. Lawrence River while on vacation in a beautiful town called Grande-Vallée on Quebec's Gaspe coastline. Various media outlets from around the world jumped on the story, which continues today when Millea and his family kick off a 12-day vacation in Québec courtesy of Tourisme Québec to commemorate the unlikely find, which Millea calls his "treasure." Highlights of the trip to Quebec, Montreal, and Grand Vallee, the coastal town where the bottle started its journey, include a visit to the Irish Memorial park on Grosse Ile, an overnight stay in a yurt, and whale watching in the St. Lawrence at Saguenay Fjord. Tourism Ireland has jumped in on the action too, inviting the two girls who sent the message, Claudia Garneau and Charlaine Dalpé, to visit the Emerald Isle this summer. The full story, which sounds almost too remarkable to be true, started eight years ago, when Charlaine and Claudia wrote their message in French on the back of a restaurant placemat with a map printed on the other side, stuffed it into a plastic soda bottle, and dropped it into the St. Lawrence River. According to Tourisme Québec, it included the instructions "to communicate with us, you can send us a message. If you don't have Internet, go to a café, to a friend's house, because we are curious to know who found our bottle!" About 2,500 miles and eight years later, Millea did. According to various news reports, he translated the message, but the e-mail address the girls provided was no longer valid, and they only used their first names in the message. However, as the news spread through the media and various social networks, the two women, now in their 20s, realized it was them. The trio finally connected on Skype, and plans were made to meet up this summer. Following Millea's trip to Quebec, Dalpé and Garneau are then scheduled to visit Ireland – one of their planned destinations is the East Passage, where their bottle was found. 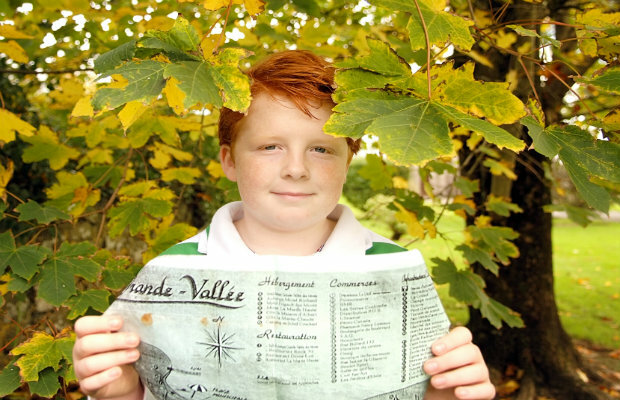 For updates on Oisin's trip to Québec, check his Twitter updates at @Oisin_in_Quebec.